When Franklin Shore, a man dead ten years, telephones his niece, Helen, giving her instructions on how to meet him, things are just beginning to get spooky. Perry must not only find out where the dead man was calling from, but also: Who killed Henry Leach, a man who was blackmailing the deceased? Who took a shot at Helen�s boyfriend, Frank? Who poisoned the deceased�s wife, Matilda? And who poisoned Monkey, the cat? + s/b "Erle Stanley Gardner's TCOT Careless Kitten"
This episode is based on the 1942 Erle Stanley Gardner novel of the same name. Submitted by PaulDrake 33, 27 October 2009. Julie Sommars would later appear in another series centered on a mystery-solving defense lawyer�Matlock. According to the IMDb, she played A.D.A. Julie March (and Matlock�s friend) in 94 episodes between 1987 and 1994. Submitted by gracenote, 4/27/2011. 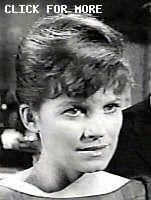 + Julie was also in a short-lived TV series called The Governor and JJ with Dan Dailey, 1969-1970. Submitted my MillieG, 3/1/18. This is one of the few Perry Mason episodes where there is no trial or evidentiary hearing. Instead, everyone is gathered into the parlor � la Hercule Poirot for the denouement. Submitted by gracenote, 4/27/2011. It's for you, Mr. Mason: Paul tracks down Perry in the doctor's office after Frank is shot. jfh 23Feb2017. Location: About 17 minutes in they drive to Empire Theatre. It�s such a tight shot I can�t be certain until I get a chance to drive by and explore but I think it�s the John Anson Ford Theater which is still rockin� and is a short drive from the studio. Submitted by Eric Cooper, 14 September 11. + As a fan of the Boston Blackie movies, Lloyd Corrigan is immediately recognizable as having played Arthur Manleder, Blackkie's millionaire friend. jfh 05Jul2018. + Monkey got his aplenty by knocking over the cups and the creamer when he jumped on the table ;) jfh 05Jul2018. 1416 N. La Brea That's Helen's address as seen on the postcard as Perry reads it to Burger. Lots of people living at that address :-) Kilo 10/15/2018.